Malin, can you tell us a bit about your background? Where does your interest in politics come from? Having my roots in the industrial west of Germany, I did not really get in touch with politics until I moved away to get my Bachelor degree in European Studies. The challenge of studying humanities is not to get lost and lose track of your goals because there are many options, sometimes too many. Thus, specializing in political science and Eastern Europe in my Master studies has been both a personal and pragmatic decision. First, because I feel really connected to this region through travels and internships and second, it opens up more career options after graduation. I get the question quite often! Why did I decide to pursue a degree abroad even though Germany probably offers a wider variety of Master degrees in my field of interest? 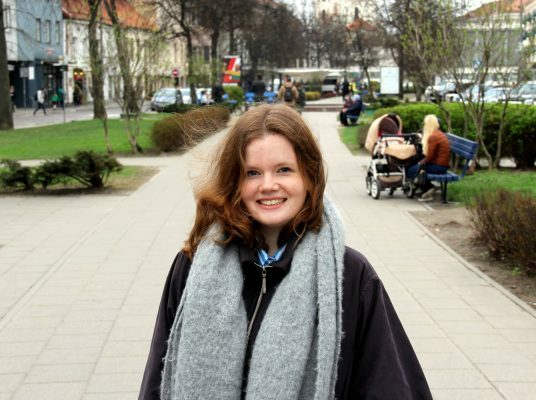 Eastern European Studies are recently getting quite popular back home, yet, I chose Vilnius because of the unique study program, being close to the area that I study and being able to get a hands-on cultural experience that nobody can take from me once I have graduated. So far IIRPS VU challenged me more than expected but I can only benefit from it. What are your academic interests? What will you be writing your thesis on? Quite unexpectedly I developed a passion for energy security and lobbying issues and the broad political economy background connecting the dots. Therefore, I am writing my thesis on Nord Stream 2 pipeline and its politicization in Germany. What would you consider the biggest pros of studying here? Vilnius is a very cozy city and perfect for studying and not getting too distracted. Other pros are small study groups and close contact with lecturers and supervisors who are really interested in your educational progress. I do not feel like simply a number in a study program here. Probably, I won’t go back to Germany anytime soon because once fully committed to living and studying abroad and enjoying it to the fullest it gets harder and harder to appreciate what you’d have in your home country. I would like to pursue an expat life in international organizations after my graduation, try to change the world a bit and settle eventually once I think I succeeded.